In its August issue, BusinessNorth gives top front-page billing to a lengthy article, Feeding the air: Northern woods poised to benefit from carbon credit market, exploring the role that forests can play in mitigating global climate change, including through participation in voluntary carbon off-set markets. The impetus and frame for the article was the February conference, Forest Values and Carbon Markets. Based on research commissioned by the Foundation on behalf of Minnesota land managers and shared at the conference, Aitkin County is now poised to add carbon sequestration to the list of public benefits for which the county will manage its land, a move which could add a significant and sustainable new source of revenue for the county, along with the environmental benefits to Minnesota and beyond. Other counties and private land owner associations are contacting Aitkin County Land Department to learn more as they consider the opportunity. 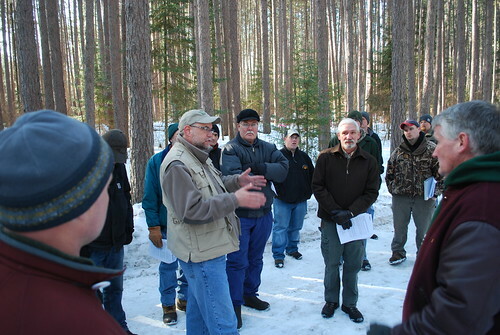 In February 2009, Blandin Foundation’s Vital Forests / Vital Communities Initiative hosted a conference, Forest Values and Carbon Markets: Opportunities for Minnesota. One outcome of the conference was a webinar that drilled deeper into the implications of carbon markets for forests and forest practices in Minnesota. Steve Morse’s presentation – Steve is the Executive Director MN Environmental Partnership, and spoke from a policy perspective from federal, state, and regional levels. Here is the third and final installment of responses from conference presenters Nate Gorence and John Gunn to your questions at the Forest Values/Carbon Market Conference in Cloquet. Thank you Nate and John for helping inform our discussion of these timely issues. And thanks as well to those of you who joined in. It is our purpose at Vital Forests/Vital Communities to catalyze and support exactly this sort of informed discussion of policy and practices that impact the economic, environmental and social well-being of forest-dependent communities and the forests on which they depend. 12. Have there been studies to estimate which sequesters more carbon over time, an intensive of managed forest vs. an old Growth Forest? Gunn: There is a growing body of work here. The assumption has been that old growth forests are carbon sources or at best, neutral. This assumption was largely based on a single site that looked at ten year period of net primary productivity, and some other studies in New Hampshire that measured biomass accumulation. A significant study recently published in the journal Nature reviewed carbon dioxide flux data from more than 500 temperate and boreal forests and found that older forests tend to continue operating as a net carbon sink for centuries. This has significant implications for how we think about the role of older forests. Dr. Bowyer presented some models of what a given stand might be capable of storing if long-lived wood products and product substitution were considered. It is crucial that we evaluate this kind of scenario using Life Cycle Assessment (LCA) methods to understand the implications of management vs. leaving it alone. These LCA studies require significant amounts of assumption – and generally find that it takes a number of rotations before the carbon benefit of wood storage in products proves to be a benefit over no management at all. How confident are we that the solid wood manufacturing infrastructure will be around in 25 years? 50 years? If we embark on a carbon mitigation strategy that relies on the assumptions of markets staying available, and they go away, what has the atmosphere gained? Is it the best precautionary approach to reserve forests from management if our only objective is carbon sequestration? These are the questions we need to continue to ask. I see these as real issues to consider as we develop policy and market mechanisms that may have unintended consequences. 13. How can we ensure that the benefits of carbon markets are distributed appropriately/ equitably? We must focus around this question in order for Carbon Market to gain effectiveness and meaning for MN citizens. I would argue that we must address small ownerships, subsistence practices and rural poverty. Please comment. Gunn: I don’t think carbon markets need to be equitable. It is fundamentally about reducing atmospheric carbon, not forest conservation or rural poverty alleviation. Carbon markets are the wrong tool for these issues. 14. How can the VCS system’s reward for less intensive management be justified, given the carbon sequestration and storage advantages of younger, faster growing forests and forest product sequestration, substitution for fossil fuels, and short-term, long-term product storage? Gunn: To continue the theme from Question 8 above, in my mind the jury is still out on the advantages of product storage and substitution. VCS is open to other mechanisms to define acceptable management – but it still needs to meet the requirements of additionality that are the core of the standard. All offset types considered under VCS must meet the same test of additionality. The concept of “fast-growing” forests has to be tempered with calculation of carbon storage. Fast-growing and small trees cannot compete with an undisturbed and complex 200 year old stand. If 80% of the fast-growing wood is being turned into paper (then sitting in a landfill emitting methane, which as Dr. Frelich pointed out is 21 times worse than CO2), the carbon advantage doesn’t exist. LCA studies based on realistic assumptions are critical to promoting the type of forest management that does indeed create a carbon benefit. Product substitution also creates uneasiness for me. As was brought up at the meeting, reducing consumption is fundamental. So, until we reduce consumption of steel and concrete products, it is difficult to assume that the creation of a stick of lumber is substituting directly for these other materials. We shouldn’t give credit for substitution unless we can prove in some manner that there is a reduction in the use of other materials. 15. It seems that there are differences in values and policies between CCX, California and East Coast- Carbon Credit Markets. Is there a movement to standardize contracts, offsets, values and policies of carbon market aggregations and carbon credit markets? Gunn: There is an interesting parallel to be made here with the development of forest certification systems. I think it has been necessary for the development of multiple carbon standards in order to fully understand the complexity of forest carbon and how best to address some of the issues like additionality and leakage. The USDA has created an Office of Ecosystem Services and Markets; I believe one of the mandates of this office will be to work on standardization. I think there will be a dichotomy between standards in voluntary and regulatory markets, and that is probably a good thing. Forests are more likely to play a more prominent role in the voluntary side. 16. How many tons/year of carbon does an “average” acre of forested land sequester? Gunn: In the end, it may be that the imprecision is what excludes managed forest carbon from playing a significant role in carbon offset markets that contain offset categories that have a great deal more precision associated with their measurement. As I suggested in Question 6 above, we need to pursue other mechanisms outside of offset markets that promote the types of practices that increase carbon storage. Programs like EQIP and WHIP provide solid examples of how we might create incentives for beneficial practices, without having to worry whether it was 1 ton or 1.2 tons of carbon being sequestered. For example, when a landowner is paid for a practice that is supposed to create habitat for ruffed grouse, we don’t care if 3 or 4 broods are actually generated on the parcel – we have confidence that the practices are generally good and the outcome is generally what we want. We can do the same with forest carbon on a large scale if the source of money is available. It is likely that if national climate legislation doesn’t include forest offsets directly, an alternate method will proposed that isn’t as concerned about precision. Thanks to Aitkin County Land Commissioner Mark Jacobs for posting such a thoughtful comment in response to my blog post summarizing some of the conversation I overheard at the end of the Forest Values/Carbon Markets conference. Mark explains that his interest in participating in the Manomet Center’s Northwoods Carbon Study was to “test” the carbon credit system in a real world situation and thereby help forest managers in Minnesota make better informed decisions on the potential costs and benefits of participating in a carbon credit payment system. Mark’s answer (so far)? Yes (probably). While emphasizing that the study remains underway with much work still to be done, Mark reports that his initial impression is that there are things that can be done to increase carbon storage without adversely impacting Minnesota’s local forest industry. In a message detailing the Business. As Usual (BAU) and alternative harvest scenarios developed for the study, Mark explains: “Based on the (study results) so far I see that our forest management system and forests store a great deal of carbon but that does not mean that it is eligible for compensation. With some minor adjustments and without reducing timber harvest volumes we could market a considerable amount of carbon credits, if the yet to be determined trade-offs are palatable. If nothing else this study has shown that forest management can play an important role in carbon storage, but the system is not set up to recognize that fact. As forest managers we should get more involved in this issue now when the systems are in their infancy. This week’s news release, from Dovetail Partners, Inc. summarizing the learnings to date from a the Manomet Center’s study of carbon credit options for Aitkin and Cass County Land Departments, reports that the carbon storage on these lands represents the annual carbon emissions of more than 5 million cars. Check out the news release here . The report was presented at VF/VC’s recent conference: Forest Values/Carbon Markets: Opportunities for Minnesota. A full copy of the report is available on the Foundation’s web site. Here’s the second installment on our Q&A with John Gunn of the Manomet Center and Nate Gorence, Policy Analyst from the National Commission on Energy Policy, inspired by the “Speak Up!” questions you turned in to us during the conference. Gunn: Not sure if I’m the best one to answer this. But, this seems to be a critical time. There is now more awareness, understanding, and desire to take large-scale action than there was when I was 22. I certainly wasn’t thinking about it then. I’m encouraged by the recent global effort to address greenhouse gases – and believe that the US needs to take decisive action this year if we’re to be part of the solution – only natural since we are part of the problem. I would be encouraged by the rapidity in which the issue has taken center stage and see it as a challenge to play a role in whatever way your skills are best suited. 7. Do you agree that Cap and Trade will give the government the ability to pick which entities survive & which fail based on political whim, not merit or consumer (market) drivers? Why should a free market nation accept this type of economic policy that will cripple our economy? Gorence: Picking winners is exactly what a cap-and-trade system seeks to avoid. Rather than using command and control types of prescriptive regulation, a cap-and-trade system creates an emissions cap for the economy as a whole and then gives all participants flexibility to make emissions reductions however they can, with whatever technologies, mechanisms, or fuels they choose. It is true that our energy economy, which has been dominated by fossil fuels for more than a century, will be transformed over the long run, but how we make those transformations will be left to the marketplace. 8. It could be argued that the concept of “additionality” favors land managers/ owners that currently are doing nothing and discriminates against those that already practicing responsible & sustainable management. Same could be said for businesses/ manufacturers who are environmentally responsible. What is the solution to this and how can responsible forest managers be rewarded for their past and current actions with this system? Gunn: It can be argued that additionality as it has been defined in the more rigorous standards does not benefit the current “good actors”. However, in the context of removing carbon from the atmosphere, don’t we gain more benefit if we get the “bad actors” to improve what they are doing? Formal carbon regulatory markets aren’t likely the best tool to reward those kinds of landowners or businesses that are already doing the right thing. It’s difficult to convince a market that it is getting what it is paying for if you can’t demonstrate that anything has changed. Remember, the offset markets are trading in offsets that are derived from many more sources than forests – and many of these sources are much easier to measure, track, and prove that they are additional. There are other mechanisms to reward the good actors and keep forests as forests – and we need to pursue those in parallel with an offset market that includes managed forest credits. 9. If other countries such as India or China do not follow Cap and Trade, should the US still plan to adopt such a system? “The Commission has always recognized the necessity of engaging other countries in any sustained and ultimately successful effort to manage climate risks—indeed it is precisely for this reason that we assign great urgency to re-asserting a leadership role for the United States. Our original recommendations therefore sought to create a direct linkage between future U.S. emission-reduction commitments and comparable action by other major emitting nations. The primary mechanism included in our 2004 recommendations for this purpose was a periodic review by the President and Congress—to be conducted every five years—for the express purpose of assessing progress both internationally and domestically and for adjusting U.S. policy accordingly. 10. How much thought has been given to rewarding forest landowners who avoid deforestation and thereby inherently provide additionality? Gunn: There is significant effort globally to promote the concept of avoided deforestation, also referred to as Reduced Emissions from Deforestation and Degradation (REDD). This concept is not currently accepted under Kyoto or the Voluntary Carbon Standard (VCS). A group called “Avoided Deforestation Partners” is developing a methodology that they propose to be accepted under VCS – with the longer-term objective of having the concept accepted more broadly in the future. REDD is fraught with many of the same issues that prove to be challenging in managed forest offsets. Issues of additionality are crucial – Was the forest in imminent danger of conversion or another form of deforestation? And can you prove it? Leakage – if you prevent one parcel from being developed, will another one next door be developed instead? We have more experience in the US dealing with permanence through the use of conservation easements to prevent conversion. It may be cost effective to pursue easements that include carbon storage as part of a suite of ecosystem service values being provided by forests. In essence then, we’ve been rewarding avoided deforestation for some time, just not being explicit about the carbon benefit. 11. What have been the costs of implementing the Kyoto protocol and has there been any measured success? What will be a measurable level of success for Cap & Trade on CC markets? Gorence: Kyoto, while imperfect and with several critical shortcomings, represents an important first step in crafting a multinational solution to climate. The next round of international climate negotiations, however, will be crucial to determining how the world addresses this problem. Given the uncertainty about the success rates of individual countries, it is difficult to assess total costs. An easy determination of how successful a cap-and-trade system is that it must achieve the emissions goals that are set as the cap. Within a cap and trade system, emissions must be monitored, measured and verified, so understanding if targets are met should be straightforward. Other goals of domestic cap and trade should be to limit economic disruptions and incorporate other countries into a global solution. Measuring these factors is not as straightforward. Readers of the VFVC Blog know of the Forest Values/Carbon Markets conference recently held in Cloquet. Over the next few weeks, we will be highlighting questions generated at the conference via “Speak Up!” cards and the answers, provided by conference presenters. This first installment is about cap and trade markets and off-set markets, with answers provided by conference presenters Nate Gorence, Policy Analyst, from the National Commission on Energy Policy, and John Gunn of the Manomet Center. 1. How is the value of carbon credits calculated and who sets the dollar value? Gorence: The short answer is that the market sets the price. Under a cap-and-trade system, the cap—the limit of emissions that can be released—determines how many credits will be available in the economy for a given year. Based on this, firms are either granted credits or buy them from the government. Once they have these credits they can buy and sell so long as they can cover their emissions obligations at the end of the year. After this market is established, prices will be discovered based on emissions trading—that is either buying or selling emissions credits depending on the relative costs to firms who reduce emissions themselves versus the costs of reducing for others. 2. How will cap& trade impact our GNP? Gorence: Once a national price is placed on GHG emissions in the U.S. and the rest of the world commits to combating climate change, large-scale transformative change will occur. It is difficult to forecast exactly when this will commence but it is imperative that the U.S. take the first step by placing a price on emitting. 4. What lessons can be learned (positive & negative) from Europe’s Cap & Trade system? Gorence: Several lessons can be taken away from the EU Emissions Trading System (ETS). It is generally viewed as a success, although certainly not perfect, in that it created and implemented a price on GHG emissions that affects business decisions. However, the design of the initial program had several initial problems, such as windfall profits for electric utilities, but the EU is actively attempting to remedy these challenges in subsequent phases of the program. For a deeper discussion please see: http://www.pewclimate.org/eu-ets. 5. It seems that there are differences in values and policies between CCX, California and East Coast- Cargon Credit Markets. Is there a movement to standardize contracts, offsets, values and policies of carbon market aggregations and carbon credit markets? Gorence: The goal of a national cap and trade program would be to create a single national system to limit GHG emissions, which would, by definition, create standardized credits across the country and harmonize existing programs. This isn’t to say that States would be limited in their ability to reduce emissions beyond the targets set by the federal government but emissions credits themselves would be standardized across programs.